Anyone hoping to become a Certified Registered Nurse Anesthetist should be sure that they know everything they need to know about the steps they need to take in achieving this goal. The nursing industry covers a wide range of specializations, but Nurse Anesthetists are particularly respected in the nursing space, as they play a key role in medical facilities, including hospitals, and help alleviate the pain and provide other important services in the surgical process. We must advise you, however, that it is not easy at all to be accepted in a CRNA program, much less complete it without any hitches. While there are more than a hundred educational institutions that offer Nurse Anesthetist programs in the United States, the programs themselves tend to be quite competitive, and it may turn out to be particularly hard to enter such programs. Prospective applicants need to have a clinical ability in their craft, no pun intended, and have relevant experience and incisive thinking skills if they would want to be admitted to a school that offers a CRNA program. The CRNA facet of nursing is getting an especially notable amount of attention, and that is in no small part due to the pay Nurse Anesthetists tend to receive. The median income for Nurse Anesthetists in the United States, according to recent labor statistics, can range from $55,940 to $215,720 per year depending on your location. The upside represents a whole lot of money you could stand to earn, and hospitals around the U.S. typically offer a lot of employment opportunities for CRNAs. This number may increase going forward, as some analysts have forecasted more than 15,000 new Nurse Anesthetist jobs created over the coming decade. We wouldn’t leave you, however, without some key takeaways about CRNA education opportunities in general. Though 100+ schools offering these programs may sound like a promising number, you have to remember that the majority of CRNA programs are offered by less institutions than other specialty tracks in nursing. You would also need to have a BSN or Bachelor’s degree and a minimum one year of acute or critical care nursing experience in order to be admitted. Those are just some of the requirements that may be asked of you, so if you’re planning to start on your way to becoming a Nurse Anesthetist, be prepared to run into some obstacles and challenges that may add up as you advance in your profession. 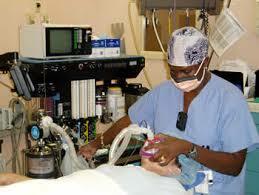 After all, the lives of your patients may depend on you first and foremost once you’re a Nurse Anesthetist.